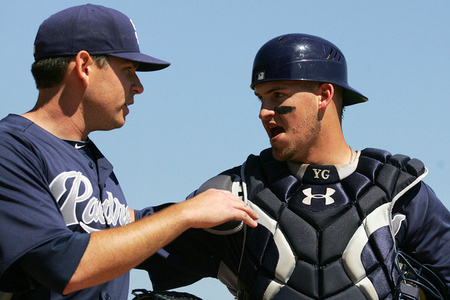 Welcome to San Diego, Yasmani Grandal. The top prospect acquired in the Mat Latos trade this past offseason has been told he's been promoted to the major leagues following today's Triple-A Tucson game, reports Daniel Berk of the Arizona Daily Star. Grandal, 23, has absolutely torn apart the Pacific Coast League this year hitting .317/.421/.500 with 4 home runs and 10 doubles. The backstop also has walked 21 times to 27 strikeouts in 34 games (145 plate appearances). I'm assuming Grandal will takeover the starting catching role, but the Padres might take it slow with him for a few weeks since he isn't a particularly good defensive catcher. Nonetheless, he should be up here to stay. Kevin Goldstein of Baseball Prospectus and ESPN.com (Insider required) wrote a terrific piece about what impact Grandal can make immediately at the big league level, less than one week ago. Without giving away too much, Goldstein writes Grandal is -- at the big league level -- a catcher with on-base skills and a bit of power.